Two long distance runners from Sikkim have won medals in the recently concluded Ruggedian Kolhapur Run- Ultra Marathon held recently at Kolhapur in Maharashtra. Sushila Rai came first in the 21 km women’s category with timing of one hour 45 minutes and 19 seconds, while Surat Raj Subba finished the 21 kms Open Marathon in second position with timing of one hour 16 minutes and 15 seconds. Likewise, another runner, Buddha Singh Subba stood finished fourth in 10 km marathon with timing of 32 minutes and 54 seconds. Marathon Man of Sikkim, Amar Subba, who was also a Brand Ambassador of the event, participated in 50 km run in 35 to 50 years category and finished in the sixth position with timing of five hours 30 minutes. 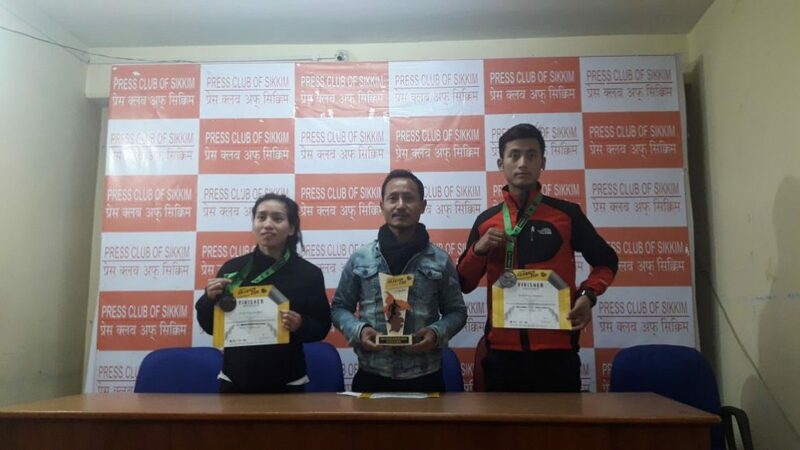 Addressing a press conference in Gangtok on Monday, Subba expressed his happiness and satisfaction on the performance of his students in the event. He added that 15,000 runners from different parts of the country and outside participated in different categories of the event. He further added that it was an encouraging performance by runners from Sikkim among national and international runners in the event. “It is a matter of great pride for me and for the State for being associated as a brand ambassador of such an international level event. It is also a matter of encouragement and motivation for youngsters to keep moving with dedication and discipline in their respective field,” he said. He further encouraged the youngsters to come to the field of marathon and make a career in the national and international levels. He also thanked all well-wishers and supporters for helping young athletes. He further thanked the State Government for supporting and honouring the sportspersons of the State. 19-years-old Sushila expressed her happiness and satisfaction with her performance in the event. “It was a tough route but I was confident to do well in the event and finally I am quite happy and satisfied to finish the race in the first position,” she said. Sushila is a class XII student of Dentam Senior Secondary School in West Sikkim and a national level footballer as well from Sikkim. “I started running marathon from August last year only after getting motivated by Amar Subba. I am happy and satisfied with my achievements in the state and national level marathons in less than one year of time,” she further said. Earlier, she came third position in Patna Marathon in 21 km category held in January this year. She also thanked Maneybong Dentam Sports Society and family members for their support to go ahead in sports. Likewise, Surat Raj Subba thanked his coach, Amar Subba for guidance and coaching to reach the present level in the marathon. He also expressed his happiness and satisfaction with the performance in the event. He also won medals in the national and state level competitions in three years of his career.